With the releases of Pro 1.3 and ArcMap 10.5, we have changed the way the Create Space Time Cube tool and the Optimized Hot Spot Analysis tool handles spatial bias. If you have run Optimized Hot Spot Analysis or created a space-time cube with previous versions of the software and recreate that analysis or cube with the exact same data and the exact same parameter settings, you may notice a change in the cube extent. This is because we have improved the way these tools mitigate spatial bias. 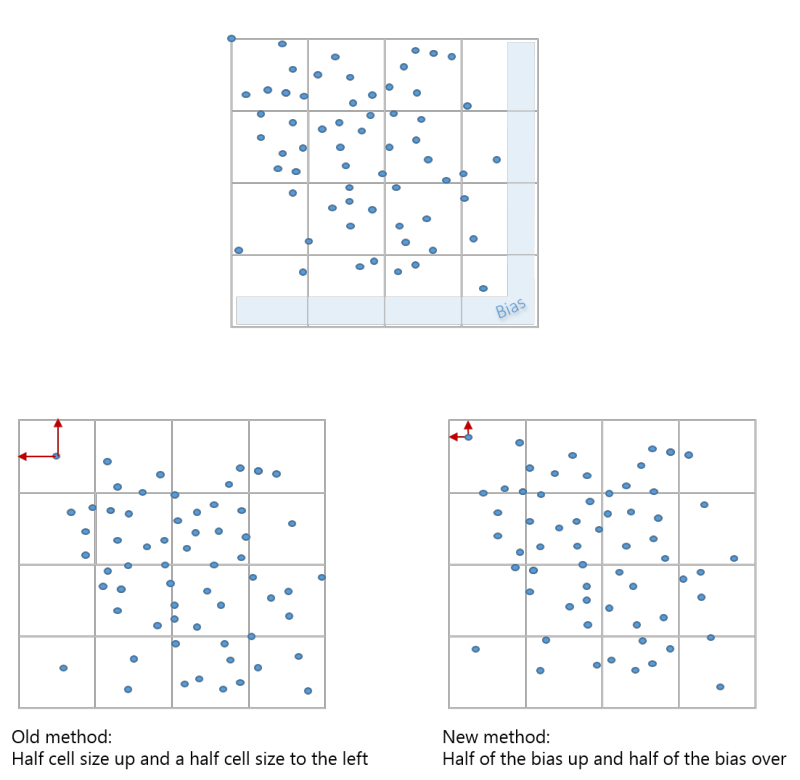 Previously, the tool would begin the grid with the left top-most data point and adjust the grid a half cell size up and a half cell size over. The new method takes the total amount of bias on the right edge and the total amount of bias on the bottom edge, splits it in half and moves the cube up and over that amount. This is a more balanced way of dealing with spatial bias and a better method for minimizing any edge effect present. The new spatial bias adjustment will provide a better result, but, if for any reason you need to recreate the cube with the previous extent, you can specify the extent using the Extent environment setting.